Buick Lucerne’s history is a fairly short one. The first model began production in 2006 and the line was discontinued in 2011. 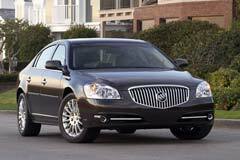 Today, the only way to acquire one is to get a used Buick Lucerne from a dealership or private owner. The model was introduced with a standard 3.8 or 3.9 liter V6 engine or an optional 4.6 liter V8. It was a 4-door sedan with an H-body platform and a 4-speed transmission for both the V6 and the V8. The exterior of the car used some of the features of various Buick models. The headlights were a bit bigger than the ones used for most other lines. As time passed by, the line received multiple upgrades on a yearly basis including newer engine options, updated front grill, fog lights, lane departure warning and a few other improvements.